Arnold & Son reinterprets its emblematic, symmetrical skeleton Nebula in new proportions. Oris is proud to introduce the Great Barrier Reef Limited Edition III, a diver’s watch created in partnership with the pioneering Reef Restoration Foundationstant to 30 bar (300 metres). 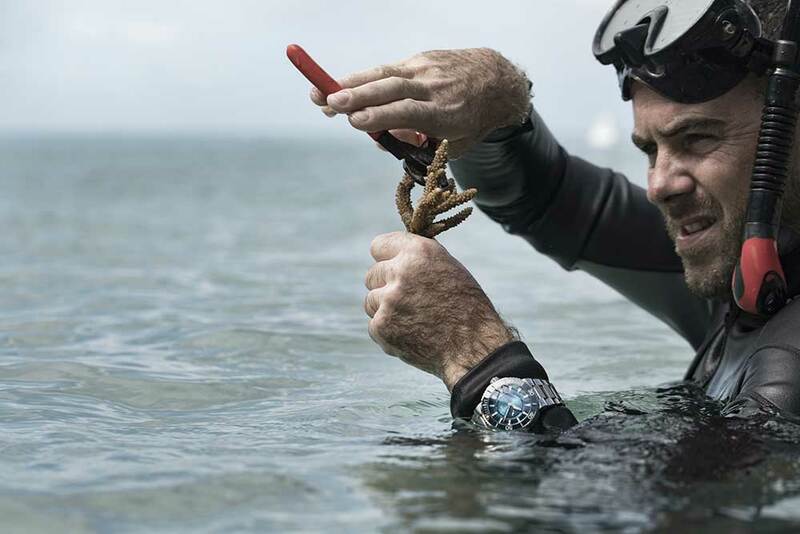 Another watch tied to the world’s oceans…? It would be easy to write off the next chapter in Oris’s mission to play a part in bringing change for the better (it’s going to take all of us), but the Oris Great Barrier Reef Limited Edition III is not just another ‘good cause’ watch. As the name suggests, this is the third watch Oris has linked to the world’s largest and most diverse reef system (it’s so big it can be seen from space, and tip-to-toe it’s 2,600 km long), but since our last Great Barrier Reef watch, the situation has far from improved. In fact, it’s got worse. Two hot summers in 2016 and 2017 led to back-to- back coral bleaching events, leaving vast areas of reefs all over the world devastated. How serious is this? The Great Barrier Reef is around 8,000 years old and home to 1,500 species of sh, more than 400 types of hard coral, a third of the world’s soft corals, and six of the world’s seven species of threatened marine turtles. We have a collective responsibility to look after it. Oris is not alone in recognising the scale of the problem. The independent Swiss watch company has partnered with a non-pro t social enterprise set up in 2016, the Reef Restoration Foundation. Using knowledge shared by the Oris-backed Coral Restoration Foundation, the foundation has begun a coral planting project off Fitzroy Island near Cairns. 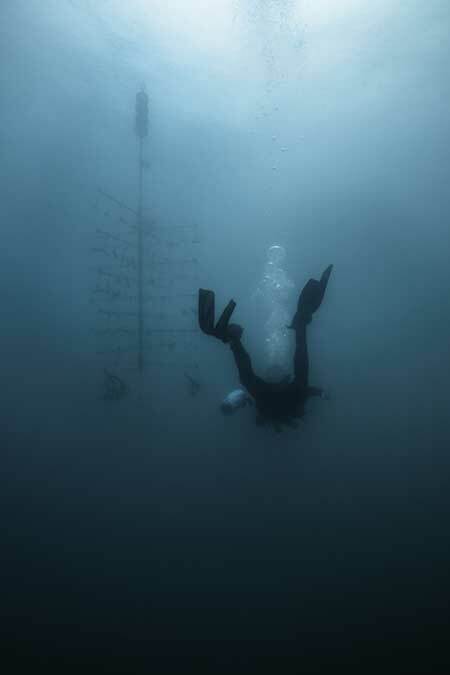 The programme is in its infancy, but with support from individuals and companies such as Oris – which installed its rst coral tree off Fitzroy Island in 2018, a milestone for the company in its mission to bring change for the better – it has the potential to make a signi cant positive difference to some affected areas of the Great Barrier Reef. In partnership with the foundation, Oris has created the Great Barrier Reef Limited Edition III, a diver’s watch based on the legendary Oris Aquis. The new model, limited to 2,000 pieces, has a gradient blue dial and an aqua blue ceramic insert in its uni-directional rotating diver’s bezel, recalling the colours of the reef waters. Inside its 43.50 mm stainless steel case is an automatic movement that provides it with a small seconds and a circular date window. It’s water-resistant to 30 bar (300 metres). 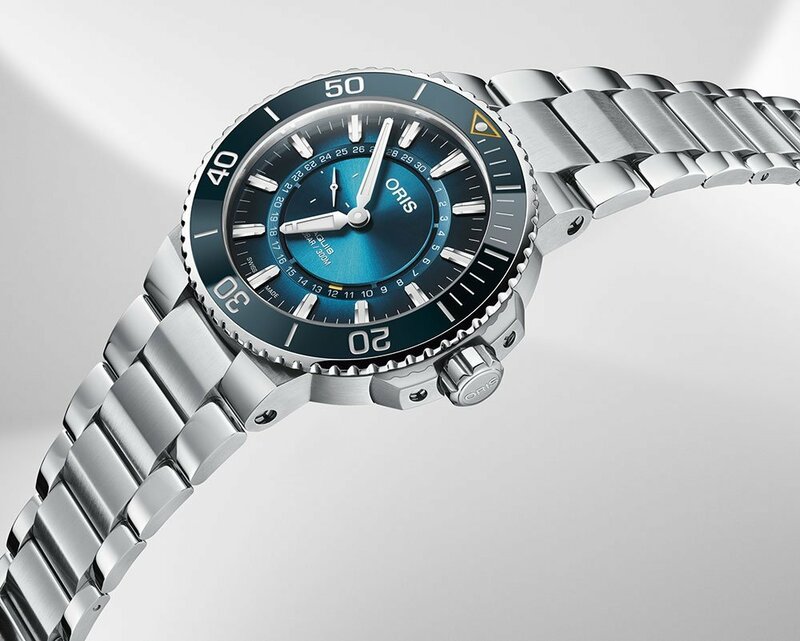 Oris is on a mission to bring change for the better to the world’s oceans. This year, the independent Swiss watch company is proud to launch The Oceans Project, a series of watches and activities that take the company’s mission to the next level. 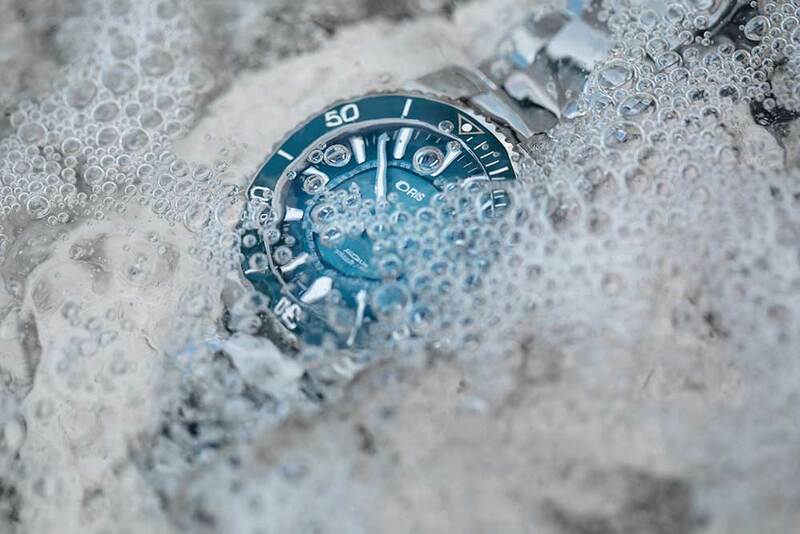 Oris has been working with a number of non-pro t organisations over the last decade, supporting conservation projects and raising awareness of the plight of the world’s water. It also recently adopted the United Nations’ 17 Sustainable Development Goals and is now implementing a series of changes that will see it behave in a more ecologically responsible, sustainable way. The Oceans Project also heralds the beginning of a series of new partnerships. The Great Barrier Reef Limited Edition III has been created in partnership with the Reef Restoration Foundation, a non-pro t social enterprise founded in 2016. The pioneering organisation has launched a programme that will help regenerate high- value areas of the reef that have suffered from coral bleaching (an event caused by rising water temperatures) during recent Australian summers. Effective coral planting initiatives are under way, with plans to expand, as its chief executive Stewart Christie explains over the next few pages. What can you tell us about the Reef Restoration Foundation? 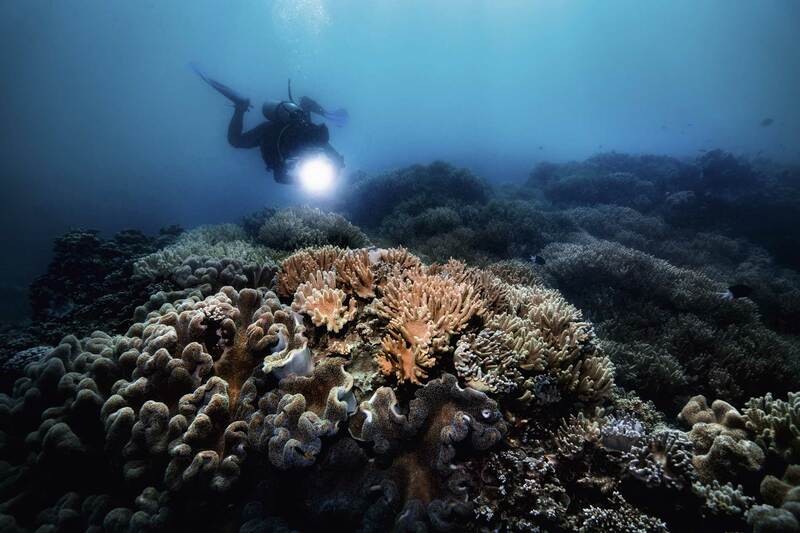 The foundation’s mission is to help regenerate high-value corals on the Great Barrier Reef with coral planting projects to counter the effects of coral bleaching. The Reef Restoration Foundation (RRF) is a non- pro t organisation set up by master diver and coral restoration specialist Gary McKenna in 2016. We obtained the rst permit to establish an ocean-based coral nursery in the Great Barrier Reef Marine Park in 2017. Gary had seen the impact of coral bleaching and been struck by the experience of his young son, who reported the devastation he’d witnessed when snorkelling over bleached coral. At the time, he was taking coral cuttings from his home aquarium and seeing them grow. He discovered large-scale coral planting was taking place elsewhere, and so joined a social enterprise programme to gure out how to create an organisation that could make a difference to the reef. What’s your role in the foundation? I’m the CEO and one of the co-founding directors. I’m originally from Scotland but moved to Australia in 2001 for the sun and to be closer to nature. Since then, I’ve worked on large engineering projects, regional economic development and sustainable economic development. I was a mentor on the social enterprise programme and asked to be paired with Gary as I’d seen similar work at Bonaire in the Caribbean. We met in August 2016 and that November I became the foundation’s chief executive. I felt I had the business skills and experience to help Gary bring this idea into reality and start making a positive impact. I didn’t want to be the last generation to experience this amazing global icon. What are the foundation’s goals? Initially, we’re looking to regenerate high-value coral reefs, and we want to grow and plant 25,000 naturally heat-tolerant corals by 2021. We also want to educate people about the reef and the effects of coral bleaching, and to advocate for policy changes that enable cost effective and scalable coral reef regeneration to occur. Obviously, we also need to raise investment, develop partnerships and build a sustainable business! Why is it so important to restore the reef? The reef is around 8,000 years old and it’s the world’s largest coral reef system. It provides coastal protection to 2,300 km of coast. It’s one of the most biodiverse reef systems in the world with amazing tropical sh, turtles, sharks, rays, dugongs and hundreds of different corals. It’s the single most important source of jobs in my community, and it also has special cultural value here in Australia and all over the world. It’s world heritage listed and a global barometer for environmental health. If we don’t take action and ght to restore the Great Barrier Reef, what else will we be prepared to lose? What exactly is coral bleaching? Coral bleaching occurs when the ocean water temperature becomes too warm. When this happens, the corals expel the algae inside them that provides them with food and colour, turning it completely white. The corals aren’t dead at this stage, but unless the water temperature cools and the algae returns to the coral, they will die. Is it the major threat to the reef? It’s one of them, yes. Coral reefs are facing unprecedented threats from a combination of climate change that’s forecast to increase sea temperatures, and cyclones that can severely damage coral reefs. Others include the declining quality of marine and coastal water, and population outbreaks of crown of thorns star sh, which eat large amounts of coral. How can those threats be combatted? The scale of the challenges facing the Great Barrier Reef and other coral reef systems around the world are signi cant, and the resources and capability needed to address these challenges are beyond one organisation or government. Skills and resources are needed from governments, philanthropic and corporate organisations and the general public to address this challenge. Hope and optimism are powerful forces, so we need to ensure people continue to care and realise that they can make a positive difference. By providing different opportunities and forums to harness the necessary skills, passion, talent and resources for people to contribute and collaborate, we can make a positive difference. I’ve witnessed rst-hand how our volunteer programme can inspire and motivate people by enabling them to experience the issues and take action. How does coral tree planting work? The reef restoration process is very similar to taking cuttings from plants to grow new plants. It mimics natural processes and involves taking cuttings from healthy corals that have survived the 2016 and 2017 bleaching events. The corals are collected and cut into mother colonies and coral fragments, approximately ve to 15 cm long. 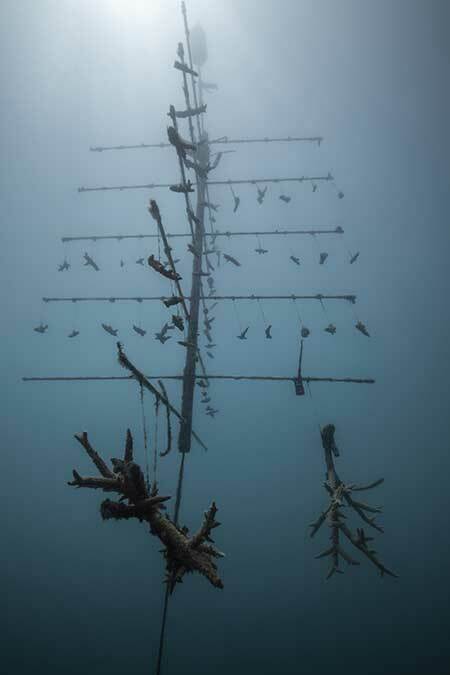 The mother colonies and coral fragments are attached to coral tree frames in an ocean-based nursery next to a damaged reef. After six to 12 months of growth, the fragments are attached back to a reef to regenerate damaged sections of the reef. From one small cutting, we can potentially create thousands of new and hardier corals. These corals will regrow and the process will become a continuous cycle allowing thousands of new corals to be created from the initial coral cutting. The methodology has been proven overseas. Nurseries in the Florida Keys and the Caribbean are growing 50,000 to 75,000 corals a year. Our mission is very viable provided we obtain suf cient support from governments, organisations and members of the general public who want to make a positive impact on the Great Barrier Reef. How long will it take to restore the reef? There’s no absolute answer to that, but what we can say is that with the forecast impact of climate change, on-going investment will be required to provide the Great Barrier Reef with the best possible chance of survival. What can we do to contribute to the restoration of the reef? First, take active steps to reduce your carbon emissions. Follow and share details of our mission online and across social media. You can also volunteer either as a diver or as a specialist with relevant skills and expertise, or help fundraise through one of our initiatives. And you can adopt a coral, a branch, a tree or a nursery, or provide a donation through our Coral Crusader programme. How did you pair up with Oris? We were kindly introduced to Oris by Ken Nedimyer, the founder of the Coral Restoration Foundation (CRF) in Florida Keys. Oris had worked with CRF previously and was looking for a partner to support who did similar work in the Great Barrier Reef. 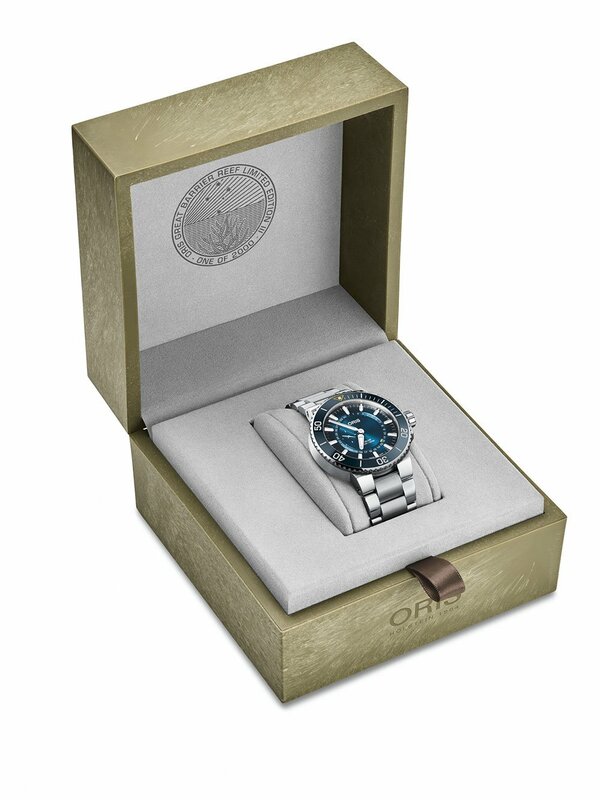 What role will the Oris Great Barrier Reef Limited Edition III play in your mission? Being associated with such a high-quality product and brand provides us with a huge sense of pride and fuels our commitment to do all we can to help the precious Great Barrier Reef. It will also signi cantly increase awareness of our work globally, which we hope will lead to much greater support for our community organisation and enable us to grow and plant much more coral. And nally, what does it mean to you to ‘Go Your Own Way’? It means being clear on your purpose and persevering no matter the obstacles – change can be challenging. Creating optimism for the future of the Great Barrier Reef is our purpose. We’re the rst organisation to obtain approval to establish and operate an ocean-based coral nursery and restoration programme on the Great Barrier Reef, and to prove the concept. We’ve recently been granted permits to expand to other high-value locations in the outer Great Barrier Reef, and we are actively seeking funding and investment to establish these nurseries. Timepieces Blog is your complete guide for luxury watch news, reviews, press releases and resources. Copyright © 2018 Timepieces Blog. All rights reserved.